When surveying rail tracks for Network Rail (they own and operate the rail network in Great Britain) using conventional survey techniques, it is necessary to employ a strict procedure for checking the accuracy of the survey. A maximum sighting from an instrument of 100m is permissible and some of the points observed from one instrument setup must be repeated at the next setup. 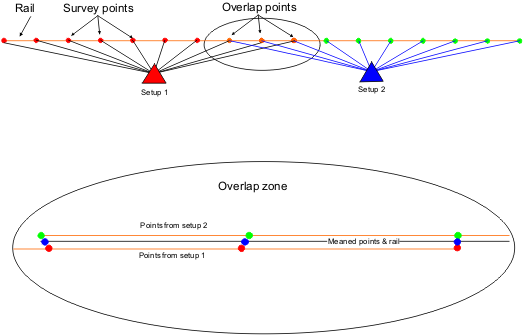 This 'overlapping' of points results in near-duplicate observations and they must be meaned in order to create one continuous, quality-assured rail string. Until now, the method of achieving this 'adjusted' (meaned) set of points has been time consuming and tedious. By incorporating the thoughts and suggestions from our customers we have, within LSS Elite, been able to provide a largely automated process which is both simple to use and extremely quick. Each rail is given a unique feature code, which means that all points from all setups along the same rail will be given the same feature code (such as RA and the next rail RB and so on). Then, for each rail in turn the proximity of the points is reported and if any lie outside of the user-defined tolerance, they will not be adjusted. Otherwise the adjustment is performed and the report may be re-run to prove the compliance of the adjusted rail. The end result is a quality assured survey which can then be exported either as an MXGENIO file (for MX Rail users) or DXF to a CAD package. The user has complete control over the colours, names and layers of everything which is exported. This is used when it is a requirement to report the rail gauge and cant (level difference between the two rails). For this report to take place the Rail Overlap adjustment must have already been done. What this report does is, for every point on the ‘reference rail’, calculate the chainage, gauge, change in gauge between adjacent points, the cant (level difference) and change in cant between adjacent points. 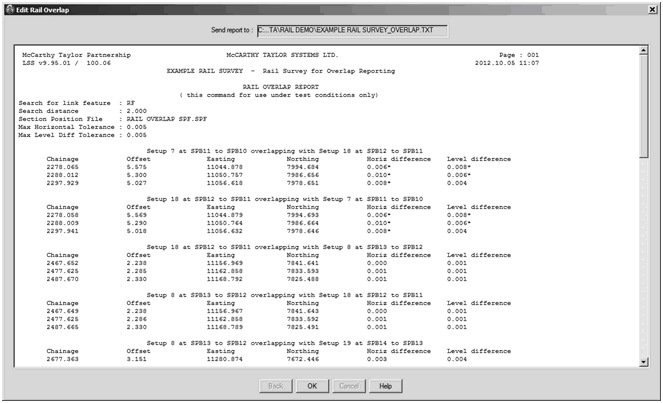 The user defines maximum and minimum values for various fields and if any of the parameters exceeds these values then they will be highlighted in the report with an asterisk, thus making it easy to spot the problems. 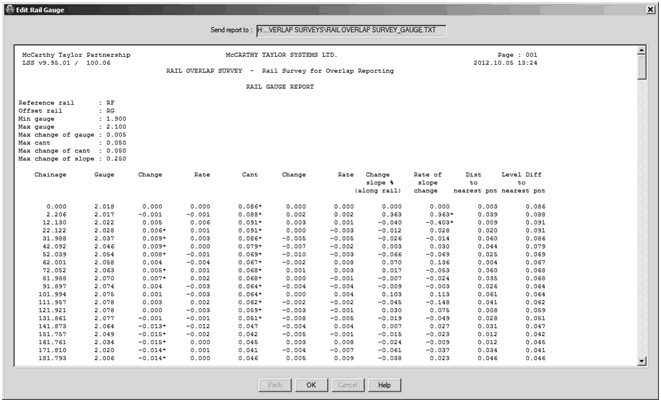 Rail Overlap adjustment and Gauge reporting are available in LSS Elite.